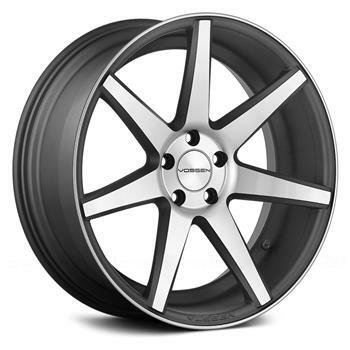 Vossen CV7 UNIVERSAL - Performance Auto Parts - Car and Truck Accessories | JM Auto Racing - Intensify Your Ride! Vossen wheels are manufactured in a low pressure casting process that compacts the metal and makes it structurally stronger than in gravity cast wheels. The VVSCV7 wheel is a deep concave monoblock design that gives you the exclusive modular wheel look at the price of a one-piece cast wheel. With over a decade of experience in the automotive industry, Vossen Wheels has finally filled the void for those who are looking for a high quality one-piece wheel. With sizes ranging from 19” to 22” and widths up to 11”, Vossen Wheels has designed its models to target the luxury automotive community with their versatile fitments and styles. All Vossen Wheels feature a stainless steel lip up to 4” inches deep that give each wheel that highly sought after multi-piece look while still being light weight. All Vossen Wheels offer tire pressure sensor capability and clearance for most high performance brake upgrades. Each Vossen Wheel is backed by a two-year manufacturer’s warranty, which proves that we stand behind our product 100%. Vossen Wheels are the perfect accessory for those who are looking to stand out in a crowd, while also maintaining comfort and proper style. Vossen’s 5 year warranty is a statement of confidence in the quality of our wheels. Every Vossen wheel is put through the highest standard in testing and quality control. These high standards allow Vossen to provide an industry leading 5 year workmanship warranty and a lifetime structural warranty, which proves they stand behind their product 100%. Within the first 5 years of ownership, if any defects in material or workmanship arise under normal and reasonable use when properly installed and maintained, Vossen Wheels will replace or refinish your wheels free of charge. Our lifetime structural warranty will guarantee the replacement of your wheel in the event of a structural failure caused by a manufacturer defect. Please contact us for our warranty guidelines and a return authorization number to file a claim.